Last fall it seemed as if Divine Intervention itself was about to lift the Rocky Mountains region ski areas from the economic purgatory following the world ?nancial meltdown.The most copious early-season snowfalls possibly in our lifetimes slammed nearly every resort in the big circuit forming a grand mountain arc within about four hours ’ drive of Calgary..It was ?xing to be an epic season — possibly also a lucrative one for a ski industry pummelled by ill-fortune. Resorts opened early and several entered the Christmas season with a base of the sort making winter-long tales and repeat customers. Tragically, the centre didn’t hold – in this case, the literal middle of the season was freakishly dry and mild. Several resorts suffered sharply reduced day-skiing and regional traf?c. Others had to cope with collapsing destination visits. Some experienced both. A couple of resorts bucked the trends, blessed with good snow and ending the season either ahead of their reduced projections for skier-traf?c or actually up from the year before. One – Marmot Basin at Jasper – opened a major new lift in a time of tight capital spending, and was rewarded accordingly. And for those skiers for whom it’s not all about the steep n’ deep, but more about sunshine, no-pressure cruisey sliding and good times with friends and family, it was a great season.. To rub salt in the wounds, it snowed more in Calgary from late April to late May than in any other winter month – possibly more than the whole winter combined. Given the continuing economic challenges, the past summer was another one of modest, incremental improvements at the following 10 ski areas. Mountain managers have been focusing on ways to boost their core product and services, improving the running of the resort and raising the attractiveness of the experience for their increasingly value-conscious clientele, while conserving scarce capital. New ideas, services and programs were being crafted for every type of skier-customer, from ?ve-day-a-year wine-skin-swingin ’ casualists to families with complex logistical comet’s tails (and expenses to match), to season’s pass-holders and financially comfortable but discerning destination travellers.For us skiers, things may not be getting glitzier, but they continue to get better – and often cheaper. Pretty, funky Marmot Basin was the only resort in our lineup to buck each of the three unfortunate trends of the past year: it had good snow through most of the season, it installed a major new high-speed lift and its skier-visits were not only above expectations but climbed by 20 per cent to 258,000, shattering the resort’s previous record. “It was the perfect winter storm,” gushes Brian Rode, Marmot’s vice-president of sales and marketing. Rode claims Marmot’s increase was the greatest of any resort in Canada last year, not just our Rockies circuit. And so Marmot earns pride of place in our 10- resort lineup this year. Last season’s opening of the $8 million, 2.3-km, 600-vertical-metre, base-to-peak Canadian Rockies Express was the culmination of several years of steady improvements and a combined $17 million investment by Marmot’s ownership group that included new terrain, new guest services, a new rental operation, greatly enhanced snowmaking and an improved kids’ area with Magic Carpet. Combined with enormous early-season snowfalls and vigorous marketing, says Rode, it led to an amazing 2,300 skiers turning out for Marmot’s November 11 opening day. Canada’s largest all-natural-snow skiing operation, part of the Ski the Big 3 destination that includes Lake Louise and Banff’s Mount Norquay, had its second-earliest opening in a decade and its greatest recorded snowfall – 173 cm – as of opening day. Despite the dry mid-winter, however, Sunshine continued chugging along thanks to its clientele of casual skiers and families seeking sunshine and nicely groomed slopes. “We have a very stable local market that kept us rockin’ all season long,” explains Sunshine’s Doug Firby. Visitations were up noticeably over the season before, extending Sunshine’s 10-plus-year run of 500,000+ skier-visits. Attendance at Sunshine’s infamous Slush Cup was the second-largest ever recorded, with nearly 5,000 people on the mountain Victoria Day. The justly fabled Delirium Dive freeride zone also remained open right to closing day, with winter-quality snow and replenishments of freshies almost to the very end. Last season was the first full year’s operation of Sunshine’s new lodge, the only on-mountain accommodation among ski areas in the national parks. “We had a really good response,” explains Firby. “The premium-priced modern rooms in the new west wing were the most popular by a large margin. You can get a whole family in there and be very comfortable. The lofts have 27 feet of glass offering a simply astounding panorama of the ski area.” The Sunshine Mountain Lodge recently received a three-diamond rating from AAA Travel. The biggest news this season is Sunshine’s installation of the new Strawberry Quad chairlift, replacing an old triple chair serving the resort’s main beginner/novice skiing zone. The Doppelmayr high-speed detachable was purchased from VANOC. It had been a temporary installation at Whistler’s Creekside base for use by spectators and competitors during the Games period. Being virtually identical in length to Sunshine’s old Strawberry chairlift, it made for a smooth changeover and Parks Canada agreed to evaluate and approve the project under its simpler and faster “like-for- like” replacement policy. The new lift rises a modest 178 metres over its 817 metres of slope, with capacity of 1,800 passengers per hour and a trip time of only 2.7 minutes. A great improvement for beginner and novice skiers, who’ll no longer have to hustle into position for fixed-grip calf-slamming. Southern Alberta skiers have come to love The Horse’s immense rugged terrain, fast full-length gondola and great grooming. Last season was Kicking Horse’s 10th in operation – although the official celebrations are being held this fall. The world’s economic travails have slowed growth of the resort’s purpose-built village, and there were some dry periods mid-season, but all in all it wasn’t a bad season. Repeated heavy snowfalls in March and into April made for an incredible close to the season and drew pretty much any local with a pulse and two pieces of lumber to slide on – as well as eager Calgarians, some of whom day-tripped the three hours each way. 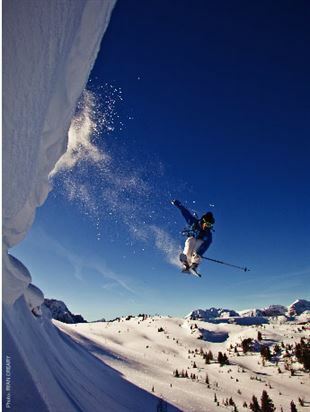 There’s a full feature on the variety of winter adventures at Golden coming up in the Travel Guide 2011 issue of Ski Canada in late November. Midway through last season the resort received official provincial approval for its new Master Plan, an important milestone that will guide its path over the next 40 years. The first major physical manifestation will be a new high-speed lift from the base area, along the alignment of the current fixed-grip Pioneer double chairlift, then upward to the base of the current Stairway to Heaven quad. This will create a second access route to relieve peak loads on the gondola. The lift is to be built over the next two or three years. New for this season is bringing the great, currently past-the-rope (i.e., non-avalanche-controlled skiable terrain) freeride zone of Super Bowl in-bounds. Lying to the south of the gondola, it’s the resort’s fourth alpine bowl on everyone’s map complete with new access trail. Other improvements over the summer included an expanded and spread-out terrain park built in a style in keeping with the resort’s rugged big-mountain nature. This included adding alpine winter features in Toilet Bowl and Bowl Over, a bunch of jumps and landings in Wapiti and Spruce, expansion of the mid-mountain progression park and a staircase feature and 20-foot wall ride right into the village plaza. This cruising and race-training-oriented day skiing operation southeast of Canmore joins Marmot Basin as the unlikely (fraternal) twin that also grew to record traffic amid the challenges of last year. The reasons: fine-tuning its core product of fall-line cruising by creating a truly superb skiing surface, coupled with installing the Gold Chair Express to replace the fixed-grip Gold Chair, while continuing to upgrade lodges and other amenities. “It was the best year ever at Nakiska for skier-traffic, and significantly so,” reports Matt Mosteller, VP, sales and marketing, at Resorts of the Canadian Rockies (RCR), which owns and operates Nakiska. “A lot of things went into it, starting with the significant capital investment, the highlight being the Gold Chair Express. People said it was not only faster, by cutting the ride time in half, it changed the way the mountain skied.” Nakiska’s 40 per cent increase to its snowmaking capacity also enabled its earliest-ever opening, November 14. Lake Louise’s irrepressible owner-manager, the flamboyant former mountain guide, rancher and oilman Charlie Locke, seems sure that better things lie ahead. He and his management team are focusing on rebuilding the mountain’s strong historical following by maximizing value and convenience. The Louise Card – an original in the skiing business – provides the first two days’ skiing for $99 and then $50 daily skiing for the rest of the season, with no blackout times or surcharges. Direct-to-lift access is now free (it used to cost $10 extra per day). For destination visitors, Lake Louise remains part of Ski the Big 3 marketing group offering all the benefits of combining a visit to the enormous multi-resort group of Louise, Sunshine, Norquay and Banff – including a combo lift pass. In terms of physical improvements for this season, the lodge seating area has been increased by glassing in some of the decks, food distribution has been improved, and the snowmaking system has been overhauled and upgraded. Locke has also invested in no fewer than three new snowcats. “Grooming is critically important to us, and we’re taking steps to address that,” he says. Locke was also working on a major lift improvement: shortening and re-aligning the moribund Olympic double chairlift to serve the milder terrain starting at the bottom of the Men’s Downhill. Our smallest resort here in terms of skier-visits and the most modest in its lift infrastructure also has some of the finest big-mountain skiing in all North America. Freeride cultists plus value-conscious regional families are Castle’s main markets. Last season skier-visits were just under 70,000, down slightly from the year before, but still up from historical averages. It was Castle’s third strongest season of operation, despite having the lowest-ever recorded snow base at the village level. Last season Castle further flexed its already ample big-mountain muscles, introducing Canada’s first ski resort-connected snowcat skiing. The Powder Stagecoach takes groups of 12 skiers from the top of the Huckleberry Chairlift on lower Mount Haig, up another 300-400 vertical metres to the top of Haig Bowl. This large zone is inaccessible by lifts but is avalanche-controlled. Uniquely in the world of snowcat skiing, the guests are loosely accompanied by a pro patroller but are free to spread out and find their own lines anywhere within the snowcat skiing zone. A well-marked collector trail at the bottom takes everyone back to the base of the Huckleberry Chair, which you then ride to the top, where the snowcat is waiting. Repeat until exhausted. Another resort in transition is Panorama in the Purcell Mountains above the Radium-Invermere-Fairmont region, the holiday playground of thousands of well-to-do southern Alberta families. Panorama normally does well in leaner snow years. Its miles of smooth carving runs, proven pedigree of superb grooming and vast snowmaking system allow it to ski nearly as well as in the big powder years. Last season, however, was reportedly something of a challenge. The skiing was just fine and the weather fabulous, but those economic problems around the world tamped down Panorama’s destination traffic. Along with regional second-home owners and locals, destination tourists are a key part of the clientele—and also the spendiest. Their absence was felt. Much better news for the long term, however, is Panorama’s transition from being a minor property in the gigantic Intrawest Corp. resort network, to being locally owned. A group of enthusiastic businesspeople organized as Panorama Mountain Village Inc. purchased the operation in February. The prime mover in the group is Rick Jensen, a prominent local entrepreneur. The near-term improvements include moving the nightskiing to the full Mile One, upgrades to the entry-level and novice skiing experience (following years focused on creating zones for extreme, freeride and glade skiing), and a vast improvement to the Mountain and Valley Shuttle service. It’s now a completely free-of-charge service that has been a big hit with locals and schoolchildren, as well as operators of valley accommodation as it knocks down one barrier to getting their guests up to the skiing in a convenient and low-cost manner. Panorama sees its long-term future as being driven by a combination of the ongoing health of western Canada’s economy and growing population, and a gradual rebuilding of the destination traffic from eastern Canada, the eastern U.S., the U.K. and continental Europe. The former group furnishes the ownership class for the mountain real estate, while the rest fly in and keep those pillows warm. For this season Fernie continued to crank out improvements aimed at adding value to a family’s skiing vacation on and off the mountain. The summer saw continued slope smoothing, brush clearing and the creation of additional fall-line shots off ridgetops. The grooming fleet this season includes two new snowcats, including a winchcat, to continue Fernie’s push into great grooming. Down in the village, Mosteller says, “We’re really raising the bar on family activities during the skiing day, après ski and in the evening, so that everyone has really positive memories.” One addition is the family private lesson program, where the whole family can ski together with one senior instructor. The small-kids’ skiing is getting a major makeover with a new Minute Maid Adventure Park. The resort has also rolled out a series of evening activities including Cowboy Camp, which features a real cowboy telling stories around a campfire about Fernie legends and lore. More mountain-focused grownups, meanwhile, can take a new winter survival course that teaches them how to build a snow shelter and identify edible plants (outside the cafeteria). Cranbrook/Kimberley area of Columbia Valley,B.C. Kimberley, above the Kootenay River valley near Cranbrook in the southern Purcell Mountains, is one of those sleeper resorts, neither rolling out peak-cconquering lifts accompanied by over-tthe-top marketing, or collapsing in corporate turmoil or debt-driven death spiral. It just ticks along, quietly building its following of regional families who discover it as a place where you trade an extra hour-and-a-half ‘s drive from Calgary for vastly lower pricing and a pleasing climate that turns a skiing condo or cabin into a true four-season vacation home. The town tself has climbed out of its trough of faux-Bavarian kitsch amusement into nicely outfitted place that’s omfortable in its own skin, with the shops and restaurants rising along with the tastes and spending habits of the tourism traffic. Cranbrook airport’s major rebuild, along with Delta’s scheduled air service from Salt Lake City, takes the region much more accessible han one might think. 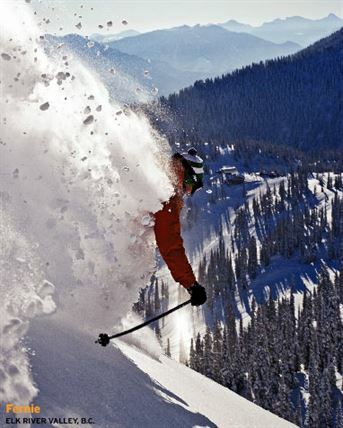 Last season Kimberley was one of four resorts in our lineup that managed to increase its skier-visits year-over-year. Skiability continues to improve as the resort works away on a multi-year glading program facilitated by the destructive mountain pine beetle,which has necessitated a massive tee culling program hroughout B.C. 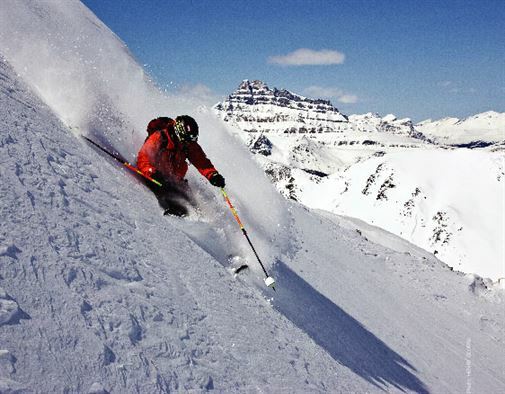 RCR, led by the canny Calgary über-magnate Murray Edwards, is transforming Kimberley into Canada’s hub of para-skiing. he new Conference and Athlete Training Centre is purpose-built for para-athletes, with all the required features, such as a waxing room, spa and massage facility, plus complete disabled access right onto the slopes.Kimberley has already hosted para-alpine nationals, Nor-Am and World Cup races. Kimberley’s bed base ontinues to be built out. The beautiful and high-end,ski-in/ski-out Mountain Spirit Hotel and Spa was recently completed and brings to four the number of modern establishments that are slopeside and adjoin the new conference centre. Mountains with great cruising, grooming and snowmaking tend to outperform in weaker snow years, and Mount Norquay last season was no exception. Its fantastic carving runs in the Mystic Ridge zone, superb grooming, close relationships with the racing set and weeks of fair mid- winter weather bolstered by its unique ski-by-the-hour ticketing saw it through.“Overall visitations were strong,” reports André Quenneville, Norquay’s gseneral manager. We had weekends of lovely weather and didn’t have to cancel a single event or program.” Ski school and the kids’ program were both up year-over-year. 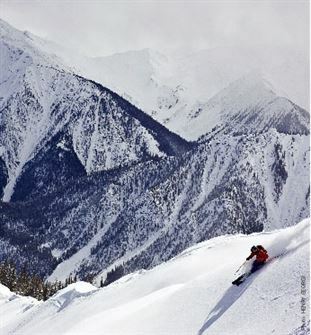 Norquay, like most resorts in our lineup, finished the season wth copious snowfalls. For those lucky few who turned out, April had the best conditions of the season. sunshine rather han a lot of snow and tricky road conditions. Norquay s making a number of improvements for his season. “We’re going to add tubing lanes, as well as other new activities to create a real kids’ winter wonderland,” Quenneville predicted back in June. Building upgrades, he boasts, are going to give us the nicest, biggest day lodge in the national parks.” Norquay’s legendary cruising should get even better, thanks to the virtually new winchcat the mountain napped up rom ANOC at a great price following the Winter Olympics.